This page shows all the settings and how to use them best. If you have any questions, please contact me. capture resizing, allows you to take huge frames from your webcam and resize them on the fly for better sharpness. 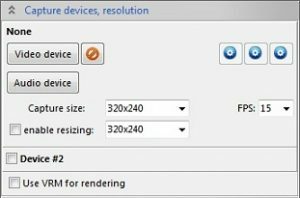 Use VRM for rendering: Uses the Virtual Render Manager for the video window. Notes: All settings are stored per video device. Changing the video device will open its codec, time-lapse and motion settings. The recorded avi will have either the selected captured frame size, OR if resize is checked, the resized frame size. Storage folder: root dir for saving movies and snapshots. Create a new folder every day: Automatically stores moview in daily sub folders. Live codec: codec used for live capture. 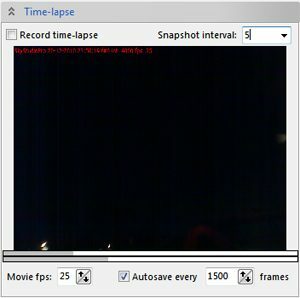 Time-lapse codec: seperate codec can be selected for time-lapse movies. Use as high as possible quality here. Personally I favor FFDShow codec at 95% quality. It produces relatively small movies in size, with good quality & sharpness. Config buttons open the codec config dialog. Prevent screensaver from starting: will prevent the screensaver from taking over as long as the program is running. Prevent shutdown or stand-by mode: will keep your PC awake as long as the program is running. Manual shutdowns will not be prevented. Notes: live video recording uses lots of cpu, make sure your codec is suitable for live recording. Time-lapse codec quality can be set to maximum, because it is not real-time. Recording: check to record, uncheck to stop recording. Movie fps: the final avi will run at this frame rate. Recommended: 25fps. The preview display shows how your time lapse will look. Click to pause/resume. Below are two bars: the upper shows current playback, the lower shows current frame being recorded. Current date/time, frame rate and frame number is added to each frame (top left). Snapshot interval: gap between each frame taken from your capture device. 5 sec means every 5 seconds a snapshot is taken and added to the movie. 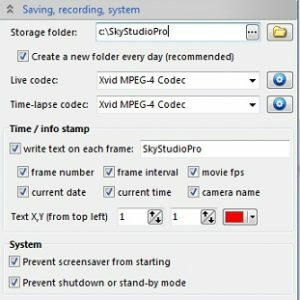 Auto-save: saves the movie and starts a new one after x frames. Purpose: if your pc crashes for whatever reason, you’ll still have most of your movie.